The Broadway revival of “Jesus Christ Superstar” will close in a couple of weeks unless ticket sales improve. How bad are sales? The actor playing Jesus has been standing in front of the theater giving away loaves and fish. Joey Edmonds came to see me at Zanies Comedy Club in 1984. I was “house emcee,” and he saw me work with Jay Leno. Edmonds was an unassuming man with short-brownish-curly hair and a friendly smile. He approached me at the end of the night, as people milled around the club after Mr. Leno had blown the roof off the place (as usual), basking in the afterglow of watching a true talent perform. I was leaving, walking past the bar and Joey touched my arm. “Nice job tonight.” To be singled out by anyone after working with a rock star was more than thrilling for a new comedian. Plus, I’ve never been averse to flattery. So I stopped. He went into a pitch. He was an agent. He had worked colleges and was now booking colleges and was always on the lookout for “new talent” to do college shows. He said I had been recommended. He liked the fact that I worked “clean,” and stayed out of the bathroom and bedroom for my premises. He asked if I had done any college shows. I had. He asked if I’d like to do more. I said yes, I’m always looking for work. For the next 16 years, Joey Edmonds and I did some 100+ (often as many as 200!) college shows per year. 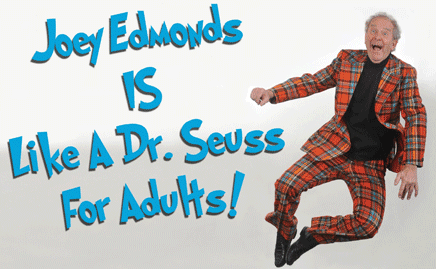 In all Joey Edmonds booked some 2,000 shows for me in every kind of post-high-school-education-environment you can name. I did Ivy League schools. I played all the “power conference” colleges and universities. I worked private schools, public schools, military schools, religious-based schools, some of the historically black colleges and universities, and community/junior colleges. Joey Edmonds kept me working. His suggestions, from what to use on stage (and what NOT to use), were the kind of thing that comes from experience. Which he had, having been a comedy act with partner Thom Curley for many years. “Edmonds and Curley” had performed on The Tonight Show with Johnny Carson in the 1970s. That performance led to thousands of shows for the duo at colleges all over the USA. He is directly responsible for the NACA (National Association for Campus Activities) “showcases,” where comedy acts get seen and booked. Joey, married to an excellent stage actress, decided to stop touring in the early 1980s. He and wife Lynn had two children, both of whom work to this day in Joey’s still-vital and successful agency. He was kind and thoughtful and decent. He understood my lifestyle, and the fact that, like him, I was not just my job – I was a husband and father who did an act. Celebrity and notoriety didn’t scale as compared to treating people with dignity and sincerity. We won awards. We made a lot of people happy. We helped raise money for philanthropies and foundations and service groups. Joey Edmonds went on doing that and much, much more for a decade-and-a-half after I left his ever-thriving agency. He is a published author whose work made a big difference in the lives of countless people – household names and many others – who work in show business. He truly touched millions of lives without them knowing it, and lived a life of class and probity. I am heartbroken he has passed away. Blessings to his lovely family.